An abandoned and ruined house inside a Commune of Santiago, Chile. Photo courtesy of Movimiento de Pobladores/as Vivienda Digna. In a country with almost 18 million inhabitants, living conditions remain extreme poverty for many. Despite accelerated economic growth in Chile - which the World Bank has directly related to the price of copper - unemployment has remained relatively stable due to the loss of momentum in "wage employment". Today, the Chilean middle class is the bulk of the population - accounting for 84.9%, according to the Ministry of Planning of the Government of Chile - but there is a 15.1% of the citizens who are immersed in poverty (about 3 million people). Many blame this on the dictatorship. As Manuel Riesco Larraín explained in his text "Development of Capitalism in Chile under Pinochet" (published by ICAL, 1989) and published by the Center for National Studies of Alternative Development (CENDA), "the most general feature of the socio-economic structure of (Chile) is the domain of capitalist production relations ", that during the decline of the dictatorship (1989), of the total number of persons employed, more than 70% corresponded to wage earners, that is, "persons which, because they lack the means of production, are forced to sell their labor power in order to survive. " These wage earners went from being "traditional tenants" in the countryside to "agricultural workers," whose expectations of owning their own land are practically non-existent within the capitalist system. The effect of the economic system during the dictatorship was a "accumulation and concentration of capital of a really spectacular magnitude", which have been perpetuated during the democratic era in recent years, where, although much has been regained in matters of freedom, the economic system remains intact, through the privatization of basic rights such as health, education, and housing. 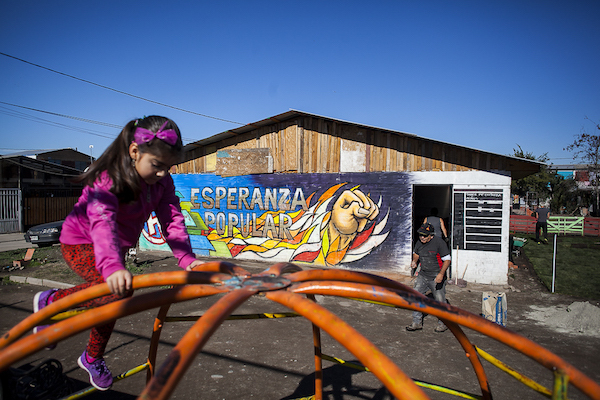 Much of the concentration of capital in the Chilean economic system includes the real estate system, where only a few own many of the urban spaces and lands, which prevents access to housing or living spaces by the disadvantaged, who remain in small overcrowded spaces. That is why civil movements that seek to obtain independent access to "decent housing" have emerged, as explained by Natalie Arriagada, member of the Movimiento de Pobladores/as por una Vivienda Digna. 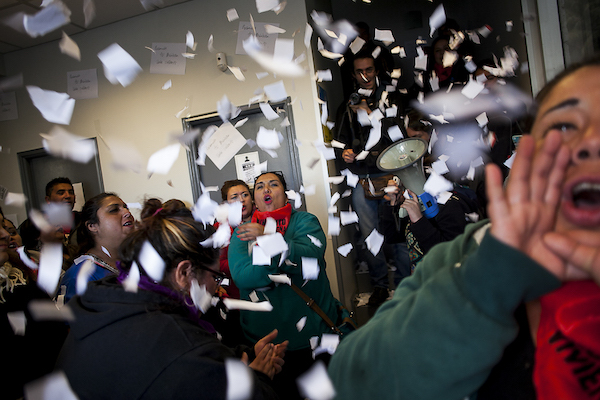 "This is a movement that is organized in different communes of Santiago. Maipú, Estación Central, La Pincoya and Santiago Centro," says Arriagada of her work in the community. "We are fighting for the right of access to housing. That is our flag of struggle. We want access to decent housing without debt." 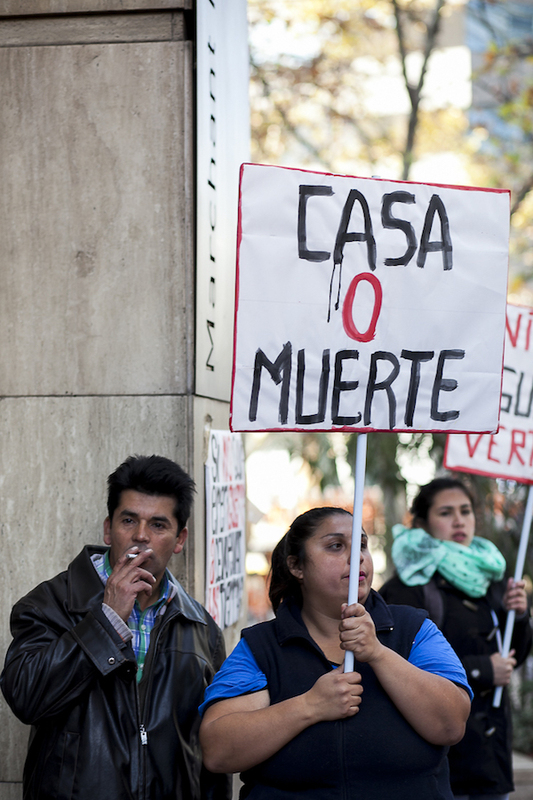 According to Arriagada, in Chile there is no "housing policy", and that is the biggest problem in the population. "The house is not regulated. There are only a few decrees which are always modified according to the current government”. As explained by the member of the group, to be able to access a house in Chile must be adjusted to the government subsidies and that is contingent to the socio-economic situation of the person - evaluated through a social card - that determines the type of help that can be obtained. "There are vulnerable, emerging and middle-class subsidies. But there is also the application through Decree 49 (postulation to a new land), which is a collective measure where Committees of Allegados organize to access the housing through a joint application. The condition becomes more critical because to obtain the subsidies it is necessary to have a base salary that justifies that the person will be able to pay the debt stipulated by the government to obtain own land. Through this system, the vast majority of people get a debt with high interest that cannot be paid and that often undermine the family economy for up to 40 years. Movements such as the Pobladores/as por una Vivienda Digna, work with unemployed people who do not have the resources to even pay a piece (known as allegados), and who live together in homes of acquaintances or relatives. "We have cases of neighbors who do not have where to live, and at night they get places to throw a mattress in the middle of the room of a relative," says Arriagada. "Struggle, commitment and daily work"
The work of this type of movement consists in the constant struggle, in the social manifestation and in the organization of groups of collective work, that pretend to look for spaces in disuse, and to complain to the companies that manage the mortgage monopoly to achieve a "fair exit" for those who remain, prisoners of the social system. "People find it difficult to understand or assume that they have a responsibility in their own reality. They always expect institutions to solve the problem, when in fact they always encourage marginalization and attachment. " Arriagada describes a reality that is perceived in the environment of Santiago, without the need for further explanation: the city is a nucleus that remains tight, and expels people who cannot access the necessary resources. According to Arriagada, "people have no right to the city. Poverty remains marginalized on the outskirts of the city, displacing many and complicating the working life of others." Much of Santiago's housing projects are carried out on the outskirts of the city when most of its inhabitants work in the center of the capital. This leads to fragmentation of the household and an increase in the population at risk of addiction and delinquency. These risks are not unknown. According to the director of the National Service for the Prevention and Rehabilitation of Drugs and Alcohol (Senda), Patricio Bustos, during the year 2016 "more than 28 thousand people received treatment" of rehabilitation for consumption of some type of toxic, of which 39% correspond to coca base, and whose most vulnerable population are children and adolescents in peripheral communes. In the case of self-managed organizations such as the Movimiento de Pobladores / as - although they maintain an anti-capitalist political profile and are heirs of the socialist movement of the 60s in Chile - they maintain their "non-partisan" condition and claim that they fight against a "neoliberal system maintained by governments after the dictatorship". "We don’t have access to health, education or housing, and yet we are the ones who support this country. It is our women who take care of the children of the rich, it is our men who make up the country's workforce, and we are the ones who move this country. " "We believe that the popular organization is the tool that we have today to be able to make force against this State that marginalizes and unprotects us," says Arriagada. The organization's proposal is to recover spaces, reactivate communal markets and attend first hand the needs of the community, maintaining an organization that doesn’t depend on any institution and which has frequently been confronted with law enforcement in many manifestations. Arriagada works with several collaborators in a system of articulated Committees, particularly in the so-called Esperanza Popular Committee, located in one of the communes with the largest "overcrowding" index of the city (Maipú), in Villa San Luis, and organize activities such as recovery of abandoned houses and collective events that energize communities and facilitate spaces for artistic creation and development (dining rooms and markets, for example). 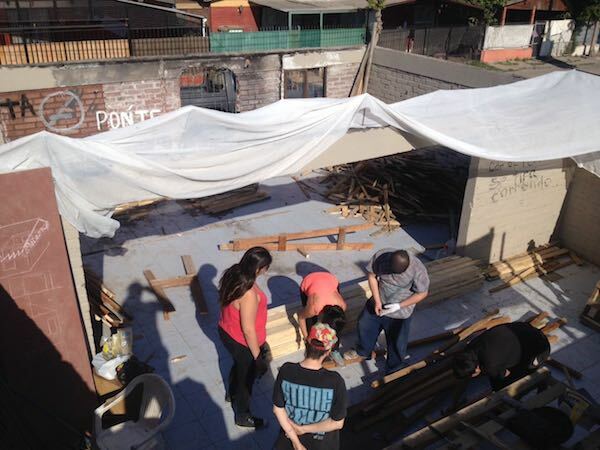 Cristóbal Saavedra, in charge of media and communication of the organization, remembers the recovery of a house that "was a landfill": "having no place to organize and carry out assemblies, we decided to take this space and build our house. It was a place dedicated to drug trafficking and prostitution and we took it ... by force," he says. Trying to organize within their communes, residents such as Arriagada and Saavedra find that the land is privately owned by the real estate, even within the most remote areas of the city. "Of the 18 kilometers that remain to be built in the Commune of Maipú, the 18 belong to a single real estate," says Saavedra. The answer, as they recall, has always been "to fight". "A group of previous workers in the organization decided to take the 'direct action' route against one of the largest real estate companies in the country, taking the spaces, researching, looking for a way to return the most active struggle and demonstration", they say, and many now face judicial subpoenas. These fighters talk about the demonstration and the expropriation of land, in a struggle of David against Goliath. 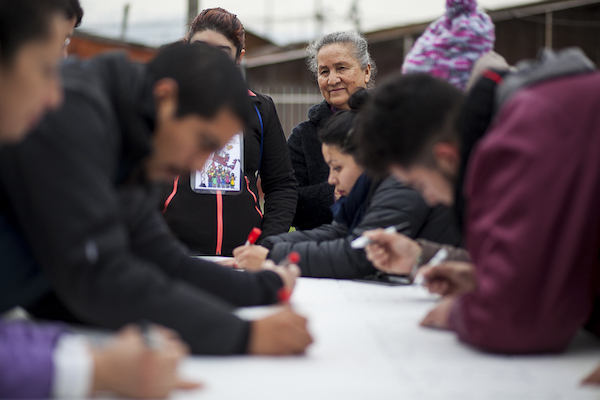 "When we lift the mobilizations directly against the State, it is because it is our last resort, and it has been part of a social phenomenon for some years, where social discontent can no longer be disguised," says Arriagada. "All the rights that supposedly exist here, are to keep you in debt. If you want to study, you have to get into debt; if you have a sick family member and you have to operate it, you have to get into debt; and if you want a home, too. When you don’t get the little money from the salary to cover all the expenses, then they come and seize your house, and they throw you back into misery ". 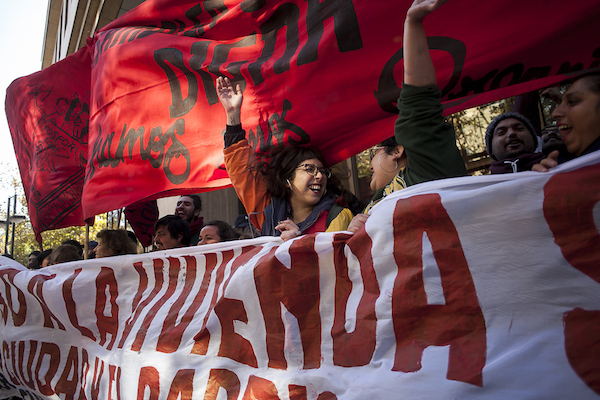 Their mobilizations have taken ministries and even the Chilean Chamber of Construction, against the promotion of privatization and private banking, and today they assert that their struggle goes beyond housing. "This is a struggle against misery," they say.